Constables Mncube, Hadebe and Khumalo, together with their teams conducted successful arrests on Monday, 14 January, when they were part of a stop-and-search operation in the vicinity of the Emahlathini Border. During the afternoon of the abovementioned date, between 14:00 and 15:00, a suspect, travelling in a taxi, was arrested for the possession of 1, 095 kg of dagga (street value R1 642-50). 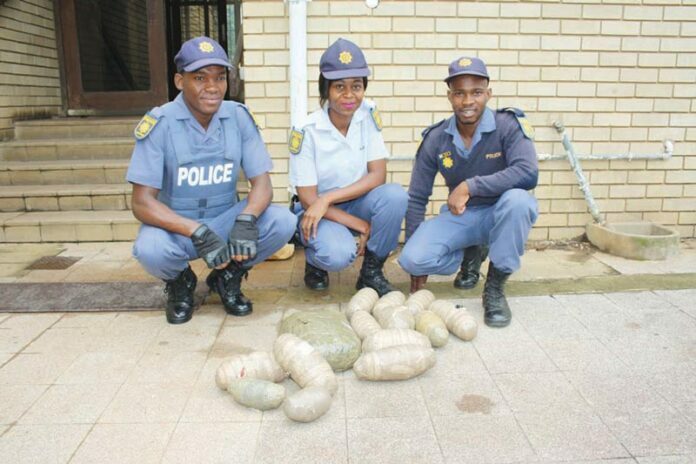 The dagga was found in the suspect’s backpack and the arrest was handled by Constable Khumalo. At around 17:00, two brothers were also arrested for the possession of dagga. They were travelling in a taxi towards Vryheid when the vehicle was stopped and searched. The taxi was evacuated and all passengers were also searched. The one brother was arrested for having nine bags of dagga, weighing 3,2 kg (street value R4 800-00) and his brother, travelling in the same taxi, was arrested with 1,3 kg of dagga (street value R1 950-00) in his possession. These arrests were successfully conducted by Constables Mncube and Hadebe. Members of the local police found 16 bags of dagga, which was hidden next to the Wakkerstroom road on Tuesday, 15 January 2019. According to one of the officers that was involved in the bust, the police received a tip-off from a concerned resident in the area. The man stated that he saw two suspiciously looking men walking around near a small bridge at the Mooihoek Farm entrance. The informant thought that they were trying to steal some of his livestock that was grazing in the area but, soon realised that they were busy with some kind of criminal activity and decided to contact the police. Upon the officers’ arrival, they started to search the whole area and came across 16 bags of dagga, hidden underneath a small bridge. 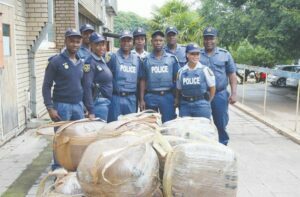 The officers seized the dagga and the weight was estimated at 220 kg (street value of R330 000-00). The police also established that the two suspects were allegedly waiting along the Wakkerstroom road for a heavy motor vehicle coming or heading to the mines in the area so that they could transport their goods to their destination. Various officers were involved in this operation and the case is under investigation. Well done to Colonel Blose and Sergeant Mndebele, together with Constables Khumalo, Mncube, Lunga, Hadebe, Mavimbela, Mgabhi, Nkosi and Khaba. You did an outstanding job!